Oh, Dollarama. The store with long aisles, bright lighting and jam-packed (but perfectly organized) shelves may seem overwhelming at first glance, but there are serious bargains to be had. Think of shopping at Dollarama as you would hunting for treasure at an antique sale — you have to wade through a lot of items you don’t need or want, but the reward is so worth the effort. 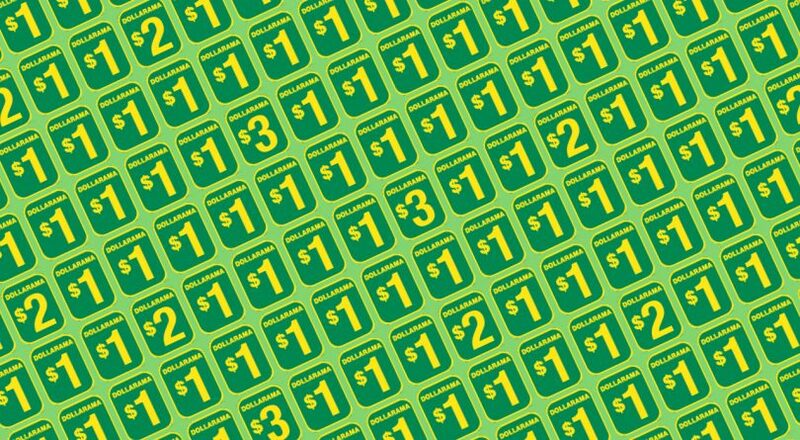 Here are some of the best deals at Dollarama. From gift bags that range in size from ring-box small to as big as a suitcase, to tissue paper and ribbon in a rainbow of colours, to wrapping paper for every occasion and even cards and gift boxes, Dollarama has all your gift-wrapping needs covered — and for much cheaper than anywhere else. And if you’re hosting a party, stock up on plastic tablecloths, plates, cups and cutlery, as well party hats, streamers and napkins, often in coordinating themes or colours. Setting up a kitchen for the first time? Dollarama is the place to stock up on plates, bowls, mugs, glasses, drinkware (beer, wine and cocktail glasses can all be found there), cutlery and cooking utensils. For under $20 dollars, you can build a 12-piece set of dinnerware. Another great deal is Dollarama’s own brand of lock-top glass food-storage containers (glass base with snap-on plastic lid), for a fraction of the name-brand version. You can also often find name-brand plastic food-storage containers for way less than retail. You’ll often find name-brand plastic wrap, aluminum foil, and dish soap at Dollarama for much less than other stores. It’s also a great place to stock up on plastic food-prep gloves (so you never have to touch raw meat), latex gloves, dish gloves (from plain yellow to frilly and fancy), dish scrubby sponges, zipper-top freezer bags in various sizes and ice packs that are the perfect size for lunch bags. When you do the math, Dollarama is the place to buy chocolate bars and candy. Full-size name-brand chocolate bars are less than $1, and the packs of mini-size bars are a steal when you compare them to the boxes sold at grocery stores. A common misconception is that dollar store chocolate and candy are stale and that’s why it’s sold for so cheap, but it’s actually because the stores get a great price by buying directly from the manufacturers and pass that savings onto you. This is hands down the best place to buy stationery. Recently, Dollarama was selling a 12-pack of Papermate Flair Felt Tip pens for $4, which retail elsewhere for $15! If you run a small business, need to buy a lot of school or office supplies, or just really like pens and notebooks, it’s worth checking out the selection at Dollarama. Aside from the obvious pens, pencils and notebooks, major deals can be had on envelopes of all sizes, bubble mailers, bubble wrap, kraft paper, staplers, scissors, paperclips, etc. Wanting to organize your pantry/cupboards/freezer, but not wanting to spend a fortune? Dollarama to the rescue! It sells a variety of storage baskets, from wire to plastic, in a range of sizes, as well as baskets that clip onto shelves, and instant shelves. Pass on the regular-sized plastic shoe boxes, which you can usually find cheaper elsewhere, but Dollarama is the only place I’ve found the half-sized shoe boxes, which are great for corralling miscellany (I use them to store onions and garlic in my pantry, cosmetics in the bathroom, and ribbon and twine in my gift-wrapping supply container). If you ever forget what season it is, just walk by a Dollarama — it’s almost guaranteed that the store’s front window will be filled with decorations for the next upcoming holiday. But aside from decorations, they also sell both indoor and outdoor gardening supplies (soil, pots, watering cans, tools) in the spring and summer, snow-clearing items like rock salt in the winter, and all the themed cookie tins you could ask for. An open secret in the crafting world, Dollarama is THE place to buy craft supplies. Last year, you could buy thick, chunky yarn perfect for those big, chunky knit blankets for a couple bucks a ball, which would have cost at least five-times that at big-box craft stores. Glue guns and glue, craft paint, canvases, paint brushes, markers, paper, decorative do-dads of all kinds, tulle, twine, raffia and burlap — chances are, if you’re looking for it, Dollarama has it. Come fall, Dollarama dedicates an entire aisle to cold-weather accessories, including socks, gloves and mitts, hats and scarves for all. Sizes range from infant to adult, and they come in a range of warmths. My personal favourites are the super fuzzy socks because my feet are always cold. In the summer this aisle transforms to sell flip-flops, baseballs caps and sun visors.